As much as I've always loved the unique-to-this-day arcade classic that is BurgerTime, I'd be hard pressed to describe it as "accessible" thanks to the daunting challenge it presents anyone who dares approach it. Thankfully, the folks at Data East--the now-defunct, Tokyo-based company was both the developer and publisher of the 1982 original--decided in the early 1990s to take another stab at the avoid-food-themed-baddies-while-piecing-together-gigantic-burgers formula that proved so appealing (if not accessible) in their earlier effort, with the result being this far more enjoyable sequel. 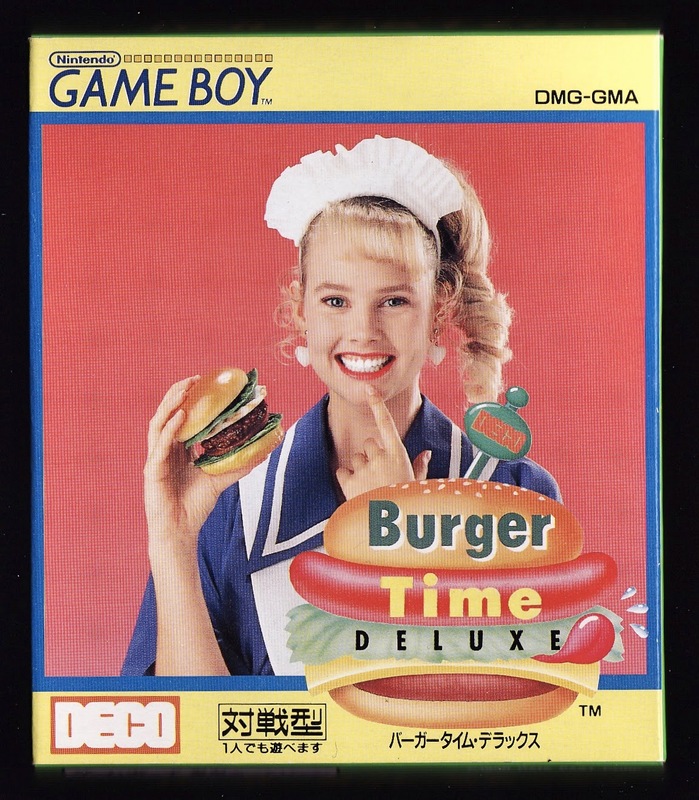 Now, that isn't to suggest BurgerTime Deluxe is some sort of pushover. In fact, by the time you reach the game's fourth "world," you'll likely be pulling your hair out as you attempt to complete at least a few of its final handful of stages. You won't be doing that because the stages in question are "cheap," though, and that's definitely a key takeaway here. Another key takeaway related to this portable platformer (of sorts): despite its obvious lack of color, it looks great on the GameBoy's (or 3DS', if that's how you roll) small screen, with well-drawn sprites that easily put to shame those found in, say, the Famicom port of the arcade original. Sure, it would've been nice if the developers had done more to change up the backdrops that support this quirky title's burger-making, condiment-escaping action, but at least they throw in a new enemy or ingredient every now and then. 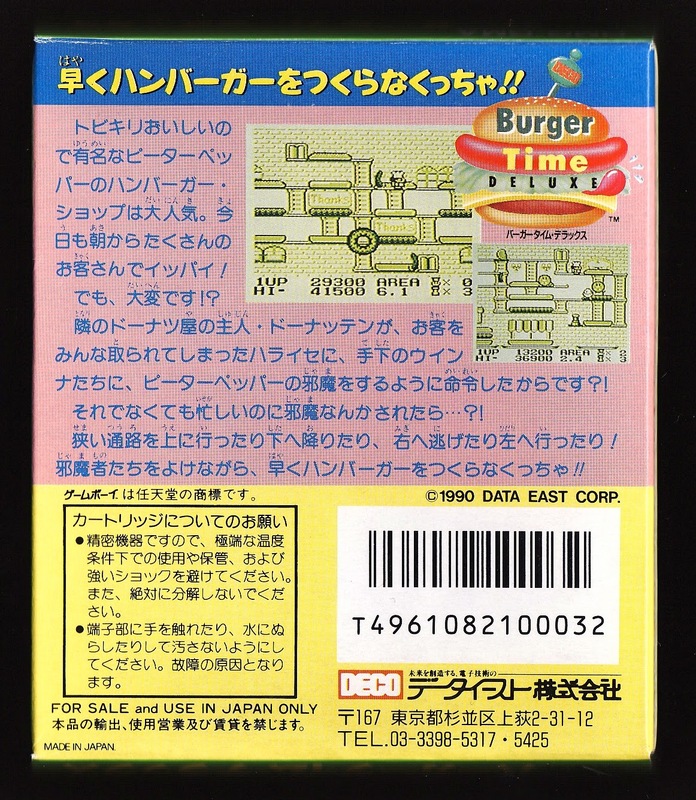 The team responsible for putting BurgerTime Deluxe together was a bit more creatively on the ball when it came to producing the game's soundtrack, thankfully, as three different tunes are divvied up amongst its 24 levels. My favorite is the lilting, peppy one that kicks things off, although the others have their charms, too. Add all of the above together and you've got a GameBoy title that's well worth exploring, especially if you're like me and you liked the idea, but not the execution, of the arcade original. It's nowhere near as deep or exhilarating as, say, Nintendo's splendid Donkey Kong revamp that was released in 1994, of course, but it holds its own against pretty much every other platformer produced for this iconic portable, and for that reason alone I'd say it deserves a look. It's pretty good. Unfortunately, it was followed up some years later by The Flintsones: Burgertime in Bedrock, a quite unnecessary Game Boy Color sequel starring Fred Flintstone and with no apparent creative input from Data East. If you'll forgive the reference, you WON'T have a gay old time. Yep, I'd say "pretty good" is an apt description of it. Really, your enjoyment of it will depend on how much you tend to like old-ish arcade games of this sort, if you ask me. As for the Flintstones game, I first heard of it long ago, after which I avoided it because, well, it didn't appeal to me in any way whatsoever, to be completely honest. Sounds like I was wise to do so! I really enjoy this game. I didn't play it back on its original release, but now it's on the 3DS courtesy of the Virtual Console, and it's one of my more played VC games.